HomeNews in PerspectiveKoroma mending political bridges – or looking for a way out? January 11, 2014 Abdul Rashid Thomas News in Perspective Comments Off on Koroma mending political bridges – or looking for a way out? If the saying ‘never burn your bridges, for you do not know whether you will need them to return’ is ever so true, Thursday’s meeting of political party leaders at State House – courtesy of president Koroma, tells you why. But is this new rapprochement, which Koroma says is in keeping with his New Year’s resolution – ‘to establish new networks of relationships’ – a mere sounding board to test the political temperature, as suspicion grows of Sierra Leone heading for a One Party State? Or is it a genuine attempt at promoting political tolerance in Sierra Leone? But if the suspected hidden agenda is right there at State House, where it is thought to have been crafted, why should the president warn the opposition party leaders not to have hidden agendas? It seems the crafty old fox is beginning to sound more like former president Siaka Stevens with every single day that passes – always hiding something up his sleeves. And is this level of presidential paranoia warranted? Many observers of the current political dynamics, shifting alliances and rancour that are taking place within the ruling APC party and by extension – the government, will agree that Koroma has lost his authority and is looking for new alliances in 2014. Last week he invited the country’s top military, police and senior judges to State House for tea, including the Chief Justice – Umu Jalloh, as in his words; “to establish a new governance approach”. His relationship with his estranged vice president Sam Sumana is not getting any better either. President Koroma is looking to build a new and more supportive political network in Kono, based on his relationship with his ruling party’s elections co-ordinating chairman – Balogun Koroma, who also like the vice president, is from Kono. He is also hoping that he can continue to enjoy the support of David Tam Baryoh, the journalist who was ‘supposedly’ detained by the police last week for seditious libel. But many Sierra Leoneans now believe that the so called arrest was falsely orchestrated by the individuals concerned, in order to deflect attention away from the huge publicity and sentiment that was being whipped up by the latest song released by the popular musician – Emerson. The anti-government song decries rampant corruption as well as the ineptitude of those in power in tackling poverty in the country. 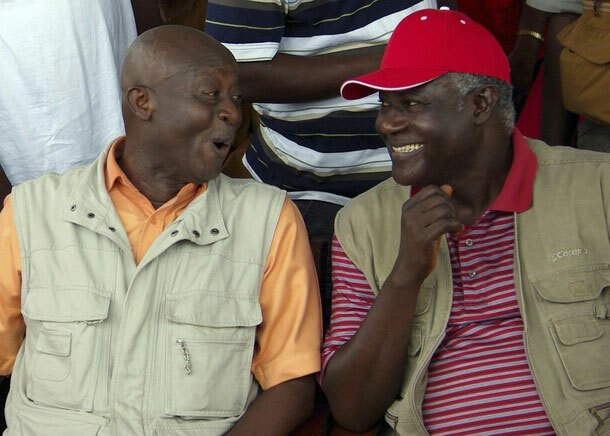 As ministers and senior party grandees continue to bite each other’s head – splitting the ruling party into factions, president Koroma is said to be looking at life beyond 2018, when he is expected to step down from the throne. Sources close to Koroma say that he has expressed a desire to continue in parliament, though he is not an elected constituency member. This raises a fundamental question as to how he envisages accomplishing that ambition. It is understood from reliable source that Koroma would like to become the Speaker of Parliament in 2018. Though the president will be in his late 60s by 2018, many believe that Koroma would find it very difficult to hibernate into quiet retirement, as former presidents of Sierra Leone have done. But lacking entrepreneurial passion and zest, Koroma is unlikely to become a globe trotter – jetting across the world – looking after the hundreds of millions of dollars he would have garnered before taking his bow in 2018. His investments in real estate in several countries are safely in the hands of agents. So, while he may not succeed in changing the country’s constitution to achieve his one party state ambition, for Koroma – continuing in parliament as the Speaker, may not be that bad after all. But will he get the support of the opposition politicians? Inviting a battered wife to a dinner may be highly plausible, but asking her to come back home can be a little bit more difficult, and opposition PMDC leader – Charles Margai knows all too well where he stands with the president. He has been bitten not once – but several times by the president. 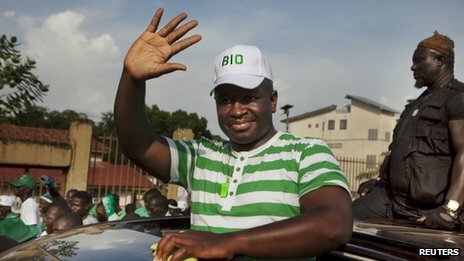 There is no love lost between Charles Margai and Koroma, upon whose instructions his human rights were taken away by the security forces, when he was arrested in May 2013, for ‘challenging’ the president’s wife over a land dispute. According to the police, Margai was “detained for subversion and for undermining state security”. The case never went to court. Adding insult to injury, Charles Margai has never forgotten the fundamental role he played as a king maker, in getting president Koroma into power in 2007. Is he willing, and has he still got the political power base to do it all over again, after the kicking he has received as a reward for all that he had done for the ruling APC party? Speaking at State House yesterday, he is said to have told Koroma that; “trust and confidence are very paramount in any interaction”. Ouch! 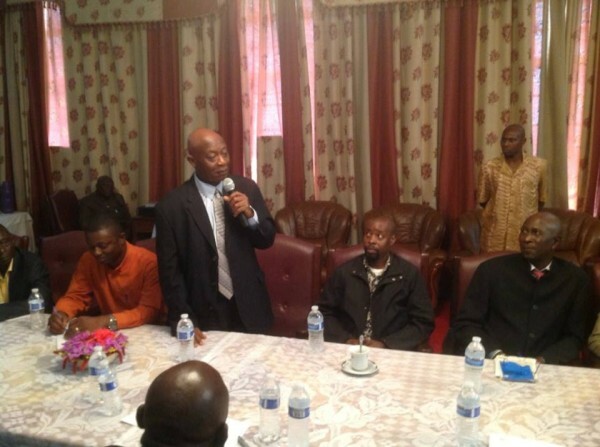 So why did Koroma invite political leaders to State House for lunch on Thursday? But the constitutional mechanism and process for achieving such a fundamental objective already exist. It is called parliament and parliamentary accountability. No matter how beleaguered the government has become, does president Koroma really need an ‘extra-parliamentary’ network of opposition politicians to be able to function? Does that not smack of real desperation for political survival? In the last five years, Sierra Leone’s fledgling democracy has been seriously undermined by political opportunism and greed, that have led to several defections across to the ruling APC. And it seems yesterday’s lunch at State House was aimed at fuelling another round of cross-carpeting. ‘President Koroma stressed the need for politicians to move freely across the political divide’ – says State House report. And by trying to conflate religion and politics, the president exposed the shallowness of his thinking that both can be the same. “Our success in achieving religious tolerance must be extended to political tolerance” he told opposition leaders. Declaring 2014 as the year of “new direction, total engagement and progress”, one cannot help thinking whether Koroma has begged, stole or borrowed that strap line and political values from the opposition Sierra Leone Peoples’ Party (SLPP). The SLPP manifesto for the 2012 elections was clearly based on a “New Direction” platform. But if the president had doubted the resolve of the opposition politicians not to ever return Sierra Leone to a one party state, the response from the political leaders was clear: Dialogue, but no coalition. State House report says that: “the political parties endorsed the initiative to consult regularly, on critical issues affecting the country within the framework of trust, confidence, transparency and integrity”. He is also said to have ‘reaffirmed his party’s commitment and faith to work with decisiveness for what he called the Agenda for Dialogue and Mediation’. 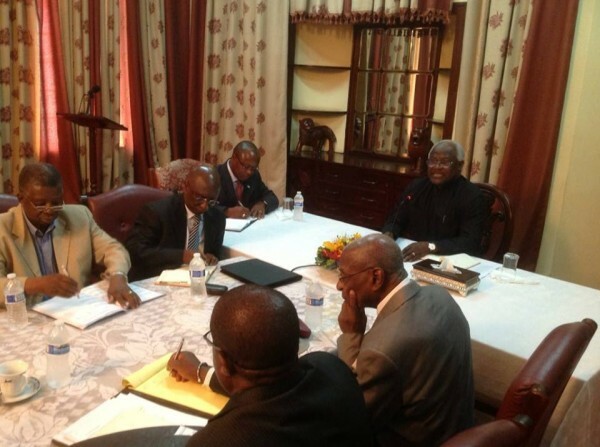 Charles Francis Margai – the Leader of the People’s Movement for Democratic Change (PMDC), is reported to have noted that ‘trust and confidence are very paramount in any interaction among political parties and commended the President for the novelty of the process’. The report says that Mohamed Bangura – the Chairman and Leader of the United Democratic Movement (UDM) – a party spun out of Charles Margai’s PMDC, but now in cohort with the ruling APC, urged his colleague leaders ‘to work hard and in unity to resolve critical national problems’. The Peace and Liberation Party (PLP) Leader – Dr. Kandeh Baba Conteh, who is strongly expected to enter into an electoral pact with the APC in 2017, is said to have proposed ‘to continue meeting for quarterly consultations to resolve national issues; and to establish a Committee of Secretary Generals of the ten political parties to sustain the process and ensure continued monitoring and timely actions’. The meeting is said to have been attended by various Chairmen and Secretary Generals of political parties, as well as the embattled vice president Sumana. Key cabinet ministers and the chairman of the Political Parties Registration Commission (PPRC) were also present. So, with the exception of one lonely voice at the lunch, calling for the formation of a Communist China style national committee of all political parties’ secretary-generals, which many in Sierra Leone would see as a precursor to a one party state, the unanimous resolve was clear: dialogue but no coalition. 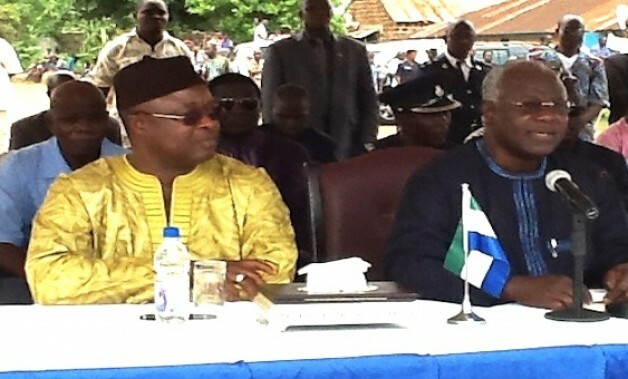 Koroma is fully aware of the hard political reality in Sierra Leone today. He knows that his APC party cannot win an outright majority at the polls, without the aid of ballot rigging, forming coalition with smaller parties, or the large-scale defection of politicians to his party. 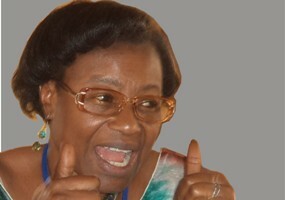 In 2007 with the unlawful assistance received from chief electoral commissioner – Christiana Thorpe, a whole swathe of the opposition SLPP ballots were nullified. And when factored into the redrawing of the political landscape, caused by the defection of Charles Margai and hundreds of thousands of his supporters across to Koroma’s APC, the game was over for the SLPP. In 2012, overwhelming evidence emerged of massive vote rigging by Koroma’s party, along with widespread intimidation and violence. But the international community turned a blind eye, simply because they felt risk averse. They did not want to risk an outbreak of another civil war if they attempted to overturn the results of the 2012 elections, as was the case in the Ivory Coast. But 2017 elections will be different. The opposition parties have become wiser and more electorally savvy. In two successive elections they have gone to the Supreme Court for a judicial review, because of serious electoral malpractice by the ruling party. And so too are the country’s civil society organisations becoming more active. They are no longer afraid of speaking out against violations of civil liberty and human rights abuse. So in 2017/2018, president Koroma is going to need another ‘king maker’ if his ruling APC party is to be returned to State House. Who shall it be? And will the international community and the country’s judiciary tolerate another electoral fraud?